TORONTO, July 30, 2015 – Avanti Computer Systems Limited, a leading provider of Print MIS solutions, today announced that it will unveil the latest features of its award-winning Avanti Slingshot at Graph Expo 15. The trade show will take place from September 13th through 16th at McCormick Place in Chicago. On Thursday, September 10th, Avanti will host a live webinar featuring the latest version of Avanti Slingshot, in advance of its full unveiling at Graph Expo 15. The webinar, which is now open for registration, will showcase some of the exciting new features. Grand Format Estimating: Leverage complex estimating algorithms to simplify the estimation and management of grand format jobs. Avanti Slingshot’s Grand Format Estimating takes into consideration unique imposition/layouts (number across/number along), material requirements, edge sealing, grommet placement, ink coverage, square inch/feet calculations, and substrate utilization to optimize your workflow. It accounts for all aspects of the process, including tiling, handling multiple rolls across the bed, ganging, as well as logistics (i.e. finishing, assembly, installation, and multi-location shipping). Gang Run Tools: Avanti Slingshot’s rules-based Automated Press Sheet Optimizer automatically processes ganging criteria and calculates the optimal layout for an Estimate and Sales order. Taking into account specifications of the press and substrate, details for the gang run, (plates, ink, substrate, and press calculations) are determined. 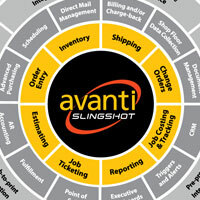 Handling all of the complexities of single form/multi form, versioning and combo jobs, Avanti Slingshot calculates and displays the number up of each item on the gang sheet and then shares that information throughout the entire Avanti Slingshot system, driving production planning, scheduling and job costing. Automated Purchasing: Manage purchases more effectively and proactively control your stock levels, costs and suppliers, and, in turn, keep accounting departments on track. Avanti Slingshot’s Automated Purchasing provides real-time visibility into all supplier transactions and supplier performance over time, and helps maintain relevant levels of inventory by generating a rules-based purchasing plan, based on the shop’s pre-set criteria. Touchless workflow: Leveraging Avanti Slingshot’s Touchless Workflow, jobs are automatically created in Avanti Slingshot’s Sales Order Module via integration into the leading web-to-print platforms. Avanti Slingshot is also fully integrated with industry-leading print production systems including Xerox FreeFlow® Digital Workflow Collection; RICOH® TotalFlow®; and HP’s SmartStream® portfolio. Avanti automatically passes all job information into either the print production environment to perform automated pre-press activities, or directly to the DFE (digital front end). Upon completion of every job, the print server automatically sends job costing and stock information back to Avanti Slingshot for billing, inventory updates, and job tracking. Avanti helps Commercial print providers and In-Plants eliminate manual processes to become more efficient and more profitable. Avanti Slingshot’s cloud-based platform, introduced at Print 13, was built from the ground up to handle multiple lines of business, enabling the company to quickly provide for changing market needs. Individuals can register for the Avanti Sneak Peek webinar here.